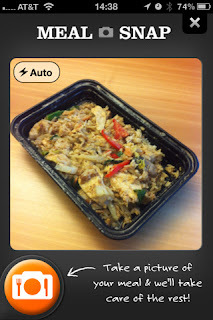 Developer Quote: "Meal Snap lets you take pictures of the meals you eat, and then magically tells you what food was in your meal." I might as well admit I am embarking on one of my New Years Resolutions rather late. In April, to be exact - 4 months late! It's another mega weight loss resolution, you know how those can be ongoing! Diets can be dismal, not only because you can't eat the yummy things you crave, but because you have to put in a fair amount of time book-keeping, as in adding up calories and various nutritional content. All in all, diets can be very exhausting and onerous. Imagine how my brain cart-wheeled in delight when I found Meal Snap-Calorie Counting Magic! This really neat app makes dieting a lot easier and infinitely more fun in keeping track of your calories because you simply take a picture of what you plan to eat and let the magical Meal Snap wizardly brain summarize the nutrition of what you've been eating, including a calorie count! 1. Snap a photo of your meal. 2. Add a descriptive caption, if you are so inclined. 3. Let the system auto-magically detect the nutritional breakdown. 4. Keep track of your meals & progress over time. Even more cool, is that you may share your meal information on Facebook, Twitter, and Foursquare, check the approximate calories for each meal as well as the full day, take a look at your history to view your past meals and categorize your meals into Breakfast, Lunch, Dinner, Snack, Tea or what have you! How much simpler could it get trying to stay on track with your calorie rationing each day? Snap a picture of your eggs and bagel breakfast, your turkey sub sandwich lunch, or Cobb salad for dinner and let Meal Snap figure out the damage (or benefit) you have done to your diet. Image recognition, or what have you, is always subject to variation so you may not get an exact accounting of the food you wish to consume. However, in my opinion, any help at saving some time is way better than nothing. Besides, isn't it nice to know that a little bit of magic lives inside your phone! COOL CONCLUSION: "Make calorie counting a snap with a quick pic from Meal Snap-Calorie Counting Magic, and a clever engine that deciphers the nutrition of your favorite foods." --Developer Link: Daily Burn, Inc.